Home / Uncategories / Where's Cinderella? Maybe she is having way too much fun with Prince Charming. The Rust and white charger is from Hobby Lobby. Glad flatware is from Horchow. 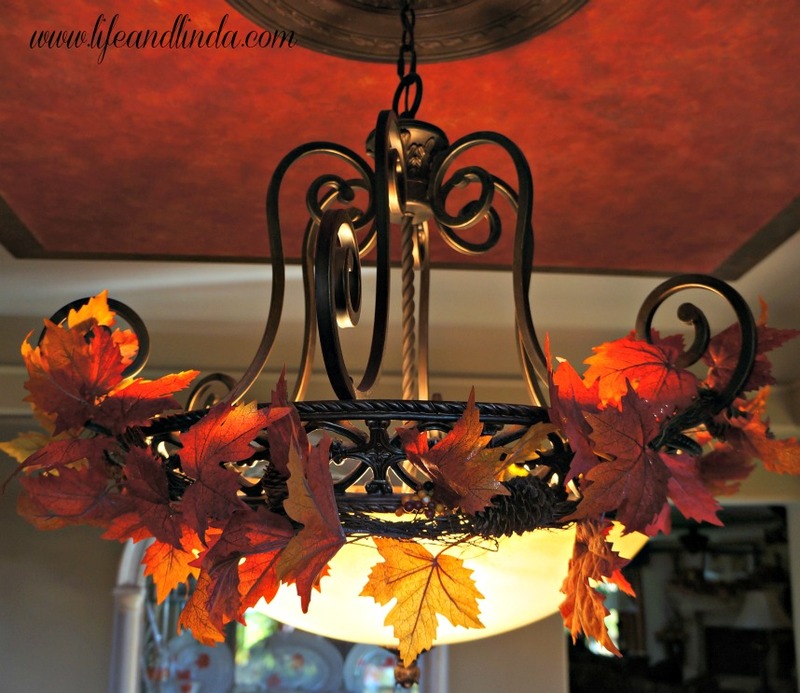 I added a leaf garland around the chandelier for drama. Two fall wreaths hang on the french doors. I got the candle holders at Ross, along with the gold led candles. The rust tablecloth is also from Ross. Thanks for visiting! Remember to vote! 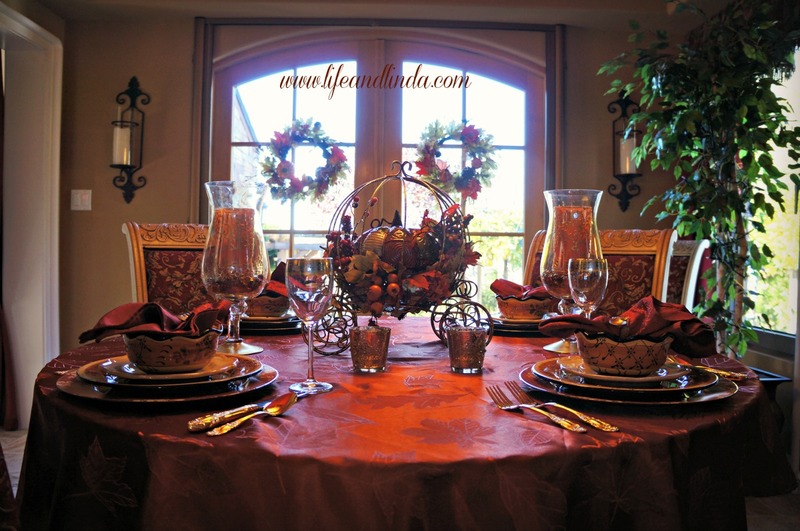 Hi Linda....wonderful warm dining room, love the rich colors.....great decorating.....Blessings Francine. And you're the Queen of Autumn Tablescapes!!! Lovely, lovely! You have the greatest stores in USA. 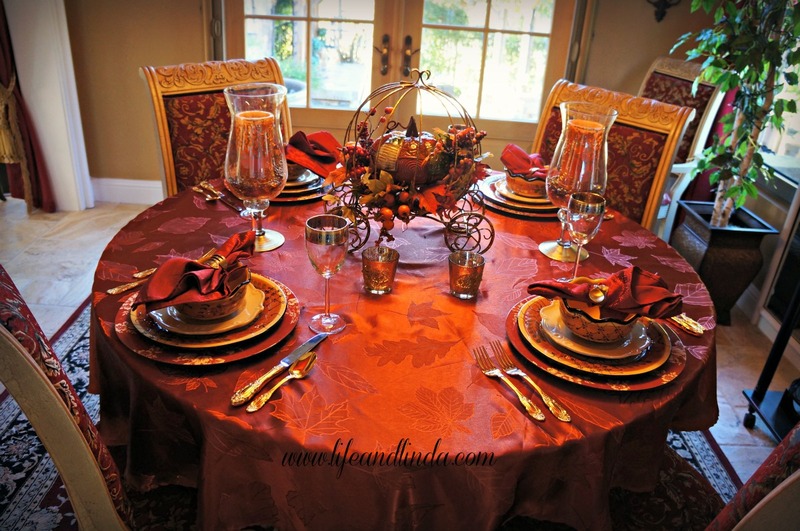 Your tablescape is simply gorgeous! Linda your table is stunning! Love that you found the tablecloth and candle holders at Ross! This is so elegant-but of course you did it. Thanks for sharing some inspiration. 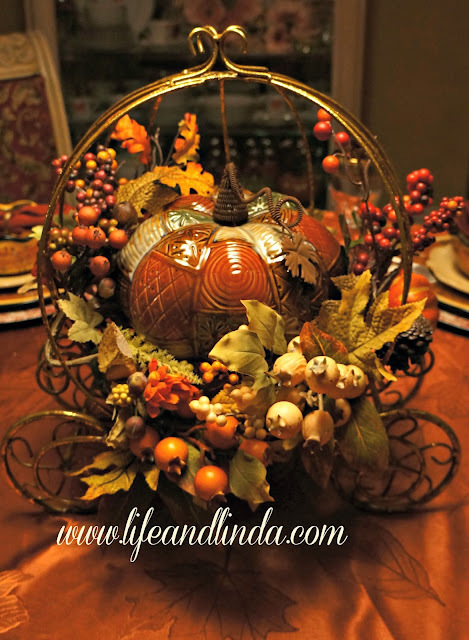 Beautiful table, Linda! I love Cinderella's coach...so pretty! This is so pretty....elegant! Thanks for stopping by and leaving a sweet note. Oh Linda this is very pretty! Starting with the beautiful tablecloth! The chargers are wonderful too! Those candleholders look perfect with the gold candles. The Cinderella coach is beautiful with the pumpkin in it! Beautiful job! Very Pretty! The Cinderella Coach come out beautiful! All the colors are lovely and I love the wreaths on your french doors. Your home is so cozy and inviting! Beautifully rustic table! I especially love the white French style plate for some contrast. And your centerpiece is magnificent, too! 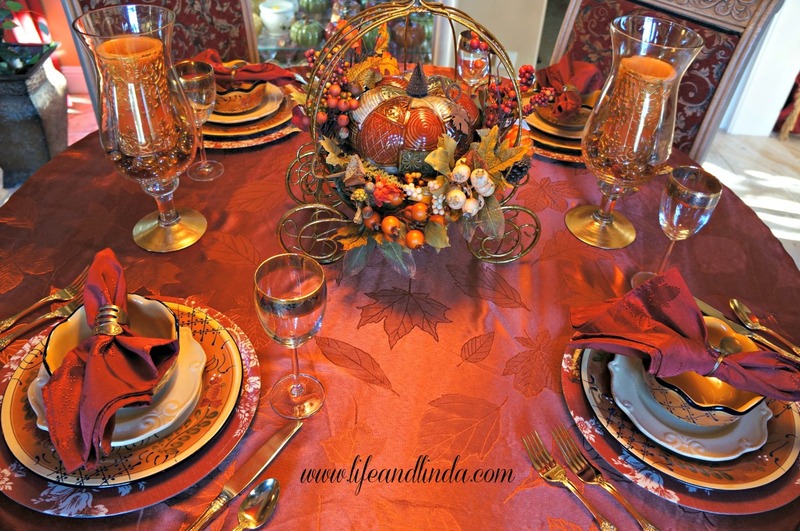 Linda your tablescape looks like a magazine. I love it! Hey there, young lady! I really like the light fixture treatment! It works out great for fall!!! The table setting is really nice, and I like how you positioned the napkin. I really like how the little pumpkin is hitchin' a ride with the big pumpkin! :-) Fit for a princess!!!! Hi Linda, Pretty tablescape. Love the coach and that pumpkin you have inside the coach! Thanks for sharing! Hi Linda, what a pretty Cinderella table. Doesn't Ross have the best deals?? I have a wire Cinderella coach but dumb me, I haven't ever brought it in from the garden and it has never been dressed up like this! What a fun centerpiece. Your colors are all so pretty. I just loved this table. What a gorgeous table...fit for a queen no doubt! Hi Linda! Such a lovely table-scape! Cinderella isn't in the photo because she is holding the camera! You and your hubby are Cinderella and Prince Charming! Thanks for sharing! Blessings from Bama! Magnificent table! Lots of time and love went into it, for sure. Linda, I love the new fall look of your blog. It's beautiful. Everything looks so spectacular. I'm so blessed to have you as my Personal Event Planner for my husband's law firm event. I know the party will be a GREAT success because of you. You're AMAZING. What a wonderful way to nestle into Fall! What a beautiful share this morning. I so enjoyed seeing your table setting. How delightful is your carriage. Everything looks so inviting. Your french doors are so gorgeous and magical with the wreaths. It is just inviting each of us in. Linda, what a fabulous Cinderella in the fall table! I love the rich colors. The carriage makes a perfect centerpiece. Beautiful tablescape and an adorable coach...love it! Just perfect for Cinderella! Wow, such pretty fall elegance.The decorations are just so inspiring for my own Thanksgiving dinner. Thank you for this. Oh, I love Cinderella's pumpkin coach, Linda. I have something similar to this, but I only put a candle inside. I love how you have decorated yours. The garland looks so festive. Rverything looks amazing. Happy Thanksgiving. Very pretty - I love the theme and how you mixed inexpensive with expensive (my kind of decorating!). 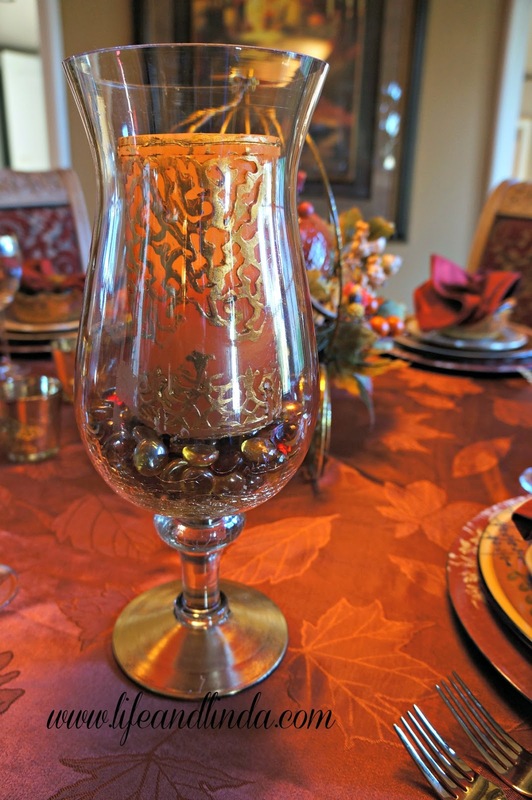 I am putting my Thanksgiving table together this weekend - so I hope it comes out as beautiful as yours. I wish I had that Horchow dinnerware - very jealous! Very pretty, Linda! 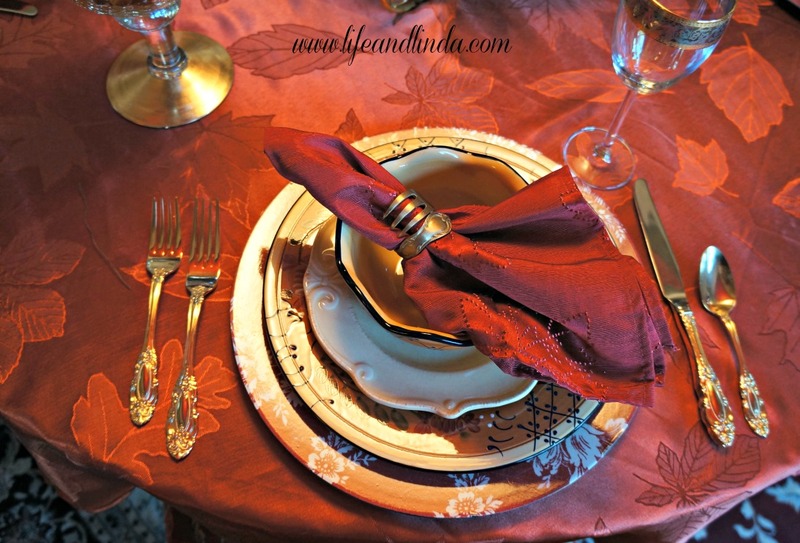 I love the warm colors of your tablesetting. The wreaths look great on your French doors. I'm thinking of doing that to our interior French doors for Christmas.